3rd grade would have been nervous pre-game, with a number of regulars missing and faced with a very experienced Gungahlin side who definitely have their eyes firmly set on a premiership. In this context coach Vejvoda will be very pleased with the effort of his side in securing a losing bonus point in going down 26-19. Semisi Qualova was again outstanding up front, while Carlos Amar held the backline together amidst the fumes emitted by a thoroughly prepared Bryce Tauloa at fly-half. The side was also bolstered by the return of Tim (insert cheap hair-related gag here) Spry from a long-term ankle injury. The gangly ginger (sorry) showed no signs of timidness in getting through 50 minutes of hard work in his return, and will be an asset for the club heading into finals. 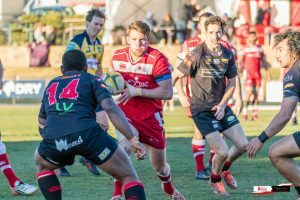 Colts showed great resilience to secure the minor premiership with a 22-13 victory in a game where they were behind on the scoreboard for long periods. The pack, led by Khalil Wilson at openside flanker, were particularly impressive in getting momentum with their ball-carrying and defending resolutely. The coaching staff will however be keen to use the week off to reiterate the need for precision in the return clash with the Eagles in the major semi-final, with the side again guilty of capping good passages of play with simple errors. The Viqueens continued their dominant season with an 81-0 win over Gungahlin. The standout of the day was undoubtedly Kate Brown, who remarkably racked up 41 individual points (including 7 tries) to again demonstrate the class which saw her picked in the Wallaroos. Stalwarts Kim Wilson and Simone Tate were also prominent in the victory. The side has done well to maintain consistency through a disjointed season, which continues this weekend with a bye leading into the finals. 2s recovered from their now customary slow start to record a flattering 34-17 victory. Despite Izzy Tittor’s assertion that he’d carried the side to the minor premiership single-handed on Saturday, the coaches should be pleased with the effort of the whole squad in winning three challenging games to close out the season. With this achievement behind them the focus will turn to making the necessary improvements to progress deep in the finals, starting with additional catching work for JP Mynhardt who murdered another try on the stroke of half time. The side will also be sweating on the fitness of try scoring machine Damian Gubler, who went down clutching a painful looking elbow injury after crossing for his second try. Probably should have passed to the unmarked Blake Henman I guess. 1s secured a heart-stopping 19-12 victory over a desperate Gungahlin, with the side having plenty of work to do heading into a major semi with a red-hot Royals outfit. Whilst the desperate defence of their own line was pleasing, particularly in the final ten minutes, the side was again guilty of leaking big meters around the breakdown. Highlights included Sione Taula ripping his own fingernail off without appearing to wince, and the individual displays of Ben Hyne, Sua Tonga and Andrew Robinson.